Smutty has been rolling with paws up laughing at recent human antics. First, a woman cut her husband with a power saw. But it was an accident, she thought he was an intruder. In another room, where the window was locked. Smutty recommends serious marital counseling. Next, Mashable asks the question, “Is Tech Too … Distracting“, the answer is “Yes”. People leave their children in stores, have car accidents and bump into buildings while talking on a cell phone or texting. My human uses her headset most of the time, but she still looks a little loopy talking to the air. Once, inside a store, she was talking to her sister in line and start laughing out loud at something her sister said. Her hair covered the headset so everyone in line moved away from her and started looking scared. This of course, made her laugh harder. Finally, she pulled back her hair and pointed out the headset. Many relieved sighs from the other customers. Too much staring at the phone or computer is not good for humans. So Smutty recommends petting your cat or playing fetch with your dog. Good for you and the pet and you don’t look loopy. Smutty can’t stop laughing. A moose landed himself in a swimming pool. Yes, a moose in a pool. Somehow the moose ended up in the backyard of a human and then tried to run the human down. Now, in the wild, the moose would have been the obvious winner of the confrontation. But in the human world, there are many traps for wild animals. The swimming pool was a danger the moose did not see coming. Once the moose fell in the pool, he did not even have sense enough to come out by himself. It took 9 humans to pull him out. I bet this moose thinks twice before wandering out of the woods again. But the moose did get the last laugh, the damage he caused to the pool and fence will cost the human a few thousand to repair. Take that, civilization! Whew, Smutty is tired. Smutty has been thinking about the relationship between humans and animals. Humans seem to believe that they “own” animals because they feed them. This is not correct. Animals belong only to themselves. For example, felines in the wild (concrete jungle) are able to hunt and catch their own food, find sleeping accommodations and have friends. They groom themselves and entertainment is as close as the nearest squirrel. When outdoor felines see humans they can either hide or attack as the meeting warrants. But humans do not do well in the wild. For some reason they shy away from eating bugs and rodents (a really good source of protein). And they won’t eat grass, which is delicious, but they will smoke it (what a waste). Also they don’t groom themselves in the wild which makes them easy prey to track by their scent. 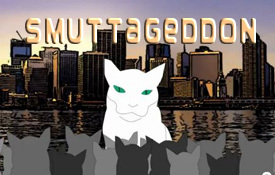 Because of all this, Smutty thinks humans should make sure all other humans have a place to live. Maybe even invite some to live with you if you are so fortunate. Then you can own them once you feed and bathe them. You can play lots of games together and have fun. Please hurry, the weather is getting colder and humans have no fur! Smutty was feeling a little down with all the depressing economic news lately, until he saw this nice picture posted on Facebook. This pic reminds Smutty that laughter is the best medicine even when you’re a cat. Hope this brightens your day whether you have 2 paws or 4.